There was a leak in the irrigation system in the front. Twice I’ve had to replace the four valves, filters, and pressure reducers, and twice the valves have leaked. This time I decided to change the whole setup and hopefully use a better type of valve. 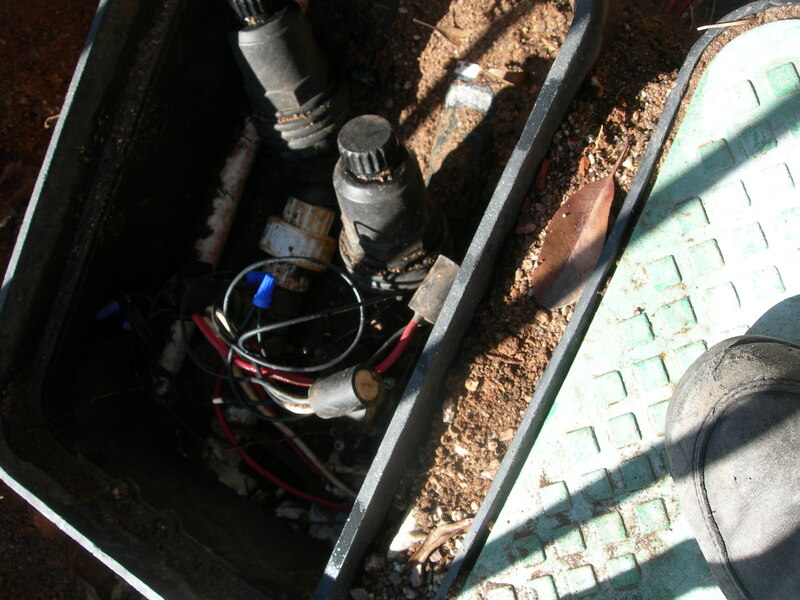 Here is a picture of two of the four valves, which are hard to see under the wires. The two prominent features are the filters. The pressure reducers are after the filters and mostly buried. Part of a white PVC pipe can be seen in the picture. This is the water source which feeds into the manifold via an elbow that is buried in the lower left of the picture. There are T’s in the manifold, one for each of the two valves shown. In the picture, I am standing on another box that houses two more valves, filters, and pressure reducers. One of the valves in the box my foot is on was stuck, partially “ON” when it was supposed to be off, letting water leak out and water a white rose bush nearby. The leak had been going on for more than a year. I dug up the area on the outlet side of the boxes which also needed attention. After the relatively easy PVC connections to the manifold and the threading together of the manifold, valves to manifold, filters to valves, pressure reducers to filters, and converters to pressure reducers, there was a complicated set of connections to get the water from valves out to plants that need water when it is hot and dry here in Tucson, which is most of the year. This valve work was done in October and early November when it was still quite warm. We have mosquitoes in Tucson now, even in our area outside of town, and with the relatively wet monsoon this summer, lots of these flying bugs made working in the cooler afternoons something less than pleasant. 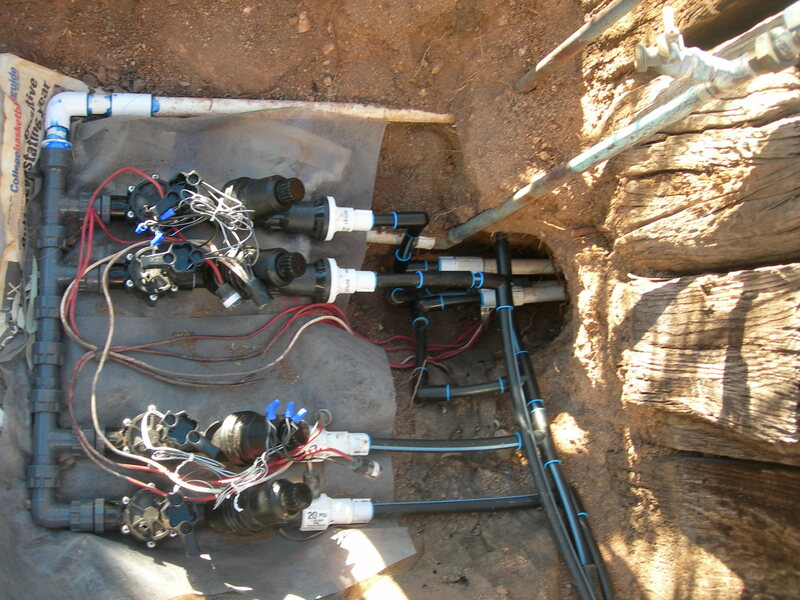 Below is a picture of some of the “black poly,” that ubiquitous feature of drip irrigation systems. Black poly pipe is problematic stuff. It makes it easy to interconnect, but is itself prone to leaking after a few years in the ground. It doesn’t fail everywhere at once. Rather it fails one place at a time such that if there is much of it in the yard, there seems to always be a leak somewhere when the valves are on doing their job of watering. This then requires digging to find the leak and clear a good length of the pipe to replace, cutting out the section that has a leak in it, putting in connectors on the ends of the remaining pipe, and putting in a section of new pipe. In this picture you can see part of the white PVC pipe that is the water source for the valves, just visible at the left edge of the photograph. There is another white PVC pipe shown leading into a brass fitting and vertical copper pipe. This second PVC pipe comes from the city water meter by the street. There is a picture later showing it, but between these two PVC pipes is an anti-siphon valve above the ground level. The anti-siphon valve is there to meet local building code requirements. It prevents dirty irrigation water from being siphoned into the fresh city water system in the case where city water pressure drops and one of the valves is on. The anti-siphon valve is also known as a vacuum break. There are three other white PVC pipes shown. These go under a brick walkway. These pipes help prevent having to dig up the walkway. Because black poly pipe is fairly short-lived, running it under the walkway would lead to much more difficult repairs when leaks occur. One of the three connections was leaking. 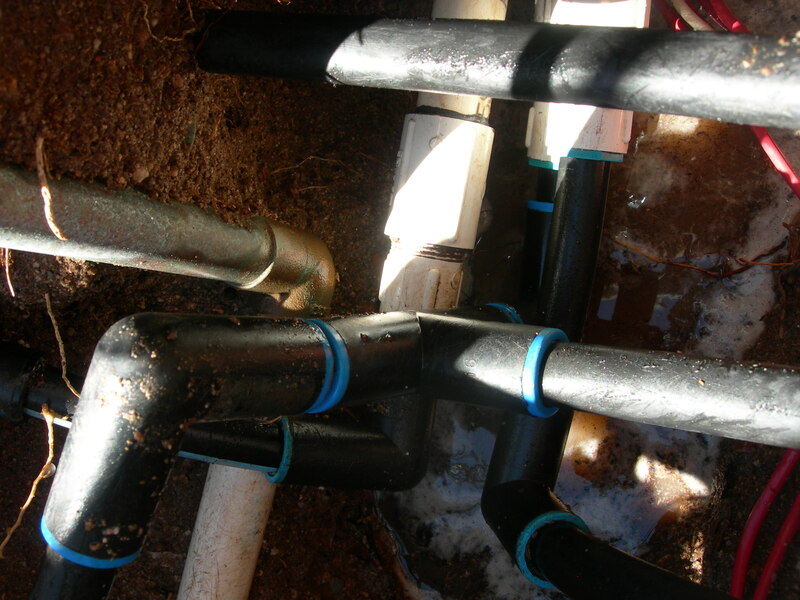 Because they are so far down in the ground, I had thought that while I had the whole mess dug up, I would cut those three PVC pipes and glue PVC fittings and pipes to make the connections to the black poly pipe easier to access. In the end this seemed like too big of a project for me, and I resolved to just put new adapters on the ends of these pipes and replace all the black poly and elbows, T’s, etc., and be done with it. In the end, the deepest of the three connections between black poly and PVC still leaked a little. I dealt with it the best I could. More on that later. The wires shown in the photograph are the control wires for the valves. The red wires are energized one at a time on a schedule controlled by the timer. The white wire splits up and goes to each valve. This sometimes is called the “common” because it is in common to each valve, while the red wires are unique, one per valve. What the white wire really provides is a return pathway for electrons to get to/from the solenoids in the valves. The solenoids in the valves operate when 24V AC is applied to them. They are AC solenoids. AC means alternating current. Alternating current means that electrons flow toward the solenoid on the red wire during half of the AC cycle, and during the other half of the AC cycle, electrons flow toward the solenoid on the white wire. Nonetheless, the white wire is called “the return” by convention. The AC current returns to the timer via the white wire. 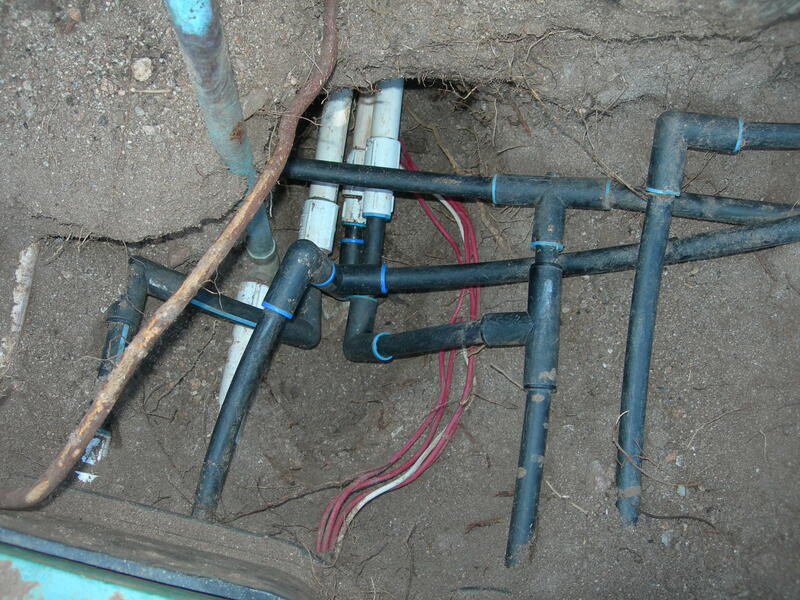 Besides what I think is a palm tree root, part of a valve box and lid, and dirt, the rest of what is in the photo are black poly pipes, interconnections between them, and interconnections between black poly pipe and PVC pipes that run under the walkway. Most of these connections I had replaced when they leaked or when I was replacing the valves before. It is quite a chore to dig down through dirt by hand, so over time when I have had it partly dug up, I made a point of replacing the dirt with sand. The sand makes it a lot easier the next time work is needed in this little area of the yard. The next picture shows a closeup of the three PVC pipes that run under the brick walkway and some of the interconnections mentioned earlier. This image is prior to the replacement of the valves. When I got to this point I could see that the three PVC pipes had threaded fittings on the ends that allow converters to be threaded-in to convert from black poly to PVC. When I saw this, I resolved to simply change the converters and black poly pipe. It was a little tricky to keep dirt out of the treads, but the Teflon tape probably helped. I don’t have a good picture of it, but pipe threads like these require Teflon tape to be on the male threads prior to threading them into the female threads. This seals the connection to make it water tight. The guy where I bought the parts said to go around only twice or three times maximum, clockwise on the male threads. If you put on too much of the Teflon tape, the tape can simply get pushed out of the way and leak a little bit. I have seen this happen. The irrigation store sells “special” wide Teflon tape that is as wide as the threaded part of most fittings for ease of use. As mentioned, the connection to the lowest PVC pipe still leaked a little after the repair. I dealt with it, but more on that later. In this picture you can see the connection to the lowest PVC pipe goes through two elbows and one T. Later you will see I made this connection a different way to avoid these back-to-back connectors. After assessing the situation, I went to an irrigation store and purchased $307 of parts and supplies. The PVC glue I got is called Red Hot Blue and does not require a primer. Some PVC glue is two-part: first you put on this really liquidy primer, and then you put on the glue. The one-step process is simpler, and seems just as effective. I initially thought I would build the manifold out of PVC pipe and fittings like the old one, but was convinced by the guy at the irrigation store to try something different. Here is the finished plumbing part of the project. There were a lot of steps to get to this point that I did not photograph. It was all pretty stressful. Doing plumbing that has to withstand city water pressure is serious business, and there is no way to know it will work until after it is done. There is a lot shown in the above picture. The manifold is the gray plastic piece to the left-hand side of the photograph. 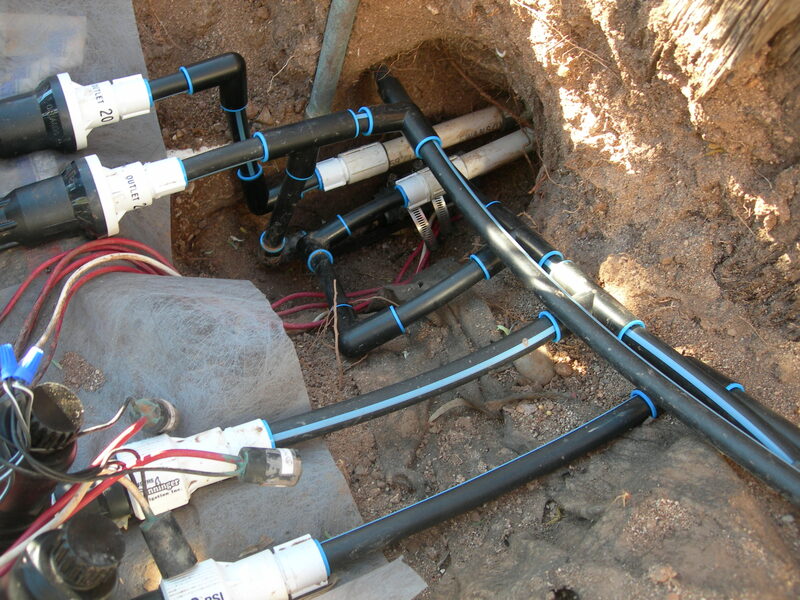 It is made up of various fittings: an elbow at the bottom left, T’s, straight fittings, and a special T fitting at the top that allows gluing a converter into it for the connection to the PVC pipe from the water source. The valves are the black things with stainless steel screws in them. The filters thread into the valves. The pressure reducers thread into the filters, and the converters to black poly pipe thread into the pressure reducers. Between each valve and the manifold is a type of union fitting. A union is a fitting with two parts that come apart. When the two parts are threaded together, the union is sealed by virtue of a rubber gasket. Half of the union is threaded into the inlet side of a valve. It has a gasket to seal to the body of the valve, but the guy at the irrigation store told me to put Teflon tape on that threaded fitting. I had to go back to the irrigation store to replace a part that was not the right type. The owner of the store was there that time, and he said the union did not need Teflon tape on it, but that it wouldn’t hurt. With this manifold system, it is possible to remove one valve, filter, pressure reducer circuit at a time for repairs or replacements. All of the fittings of the manifold have gaskets. It went together very easily, and only needed hand tightening. The whole assembly of the manifold, valves, filters, pressure reducers, and converters for the black poly could be constructed indoors on the kitchen table. Beyond the gray manifold connections, all other connections required Teflon tape, but only hand tightening. I glued the PVC converter to the special T fitting of the manifold outside on the front porch. With that done, I was ready to connect the assembly up to the supply line. There is a shutoff valve after the anti-siphon valve (not shown) that allows water to be shut off from the irrigation system. With water pressure off, I cut the supply line with a hacksaw blade with duct tape wrapped on one end as a crude handle. After cleaning up all the burrs and little bits of PVC, I could glue on a straight connector fitting and the elbow and other short pieces of pipe to make things ready for gluing the manifold to the water supply line. I put newspaper on the dirt to help keep dirt out of the glue applicator and PVC connections. After I made all these PVC connections, I realized the elbow needed to be close to perfectly horizontal if the manifold was to be horizontal. I has just sort of eyeballed the connection of the elbow, and it came out OK. If I were to do it again, I would be a little more careful to ensure the manifold would be lying flat. After setting the manifold assembly, I could connect it to the existing black poly and PVC pipes under the walkway, and then connect the wires to the valves’ solenoids. When I turned on water pressure, there were some little leaks here and there in the manifold and between the manifold and the valves. I was able to hand tighten the connections and stop the leaks. The owner of the irrigation store said not to use tools to tighten the connections, that this would lead to problems “down the road.” Two of the filters leaked when water pressure was on. The filters come apart and have O-rings to prevent leaks. I had to go back to the irrigation store to get a couple of new O-rings to fix these leaks. I bought a roll of landscape fabric at The Home Depot and put pieces of it under the two sets of valves. this was in an attempt to keep sand from invading under the valve boxes and into and around the valves. I left the newsprint in place. The next picture shows a closeup of the black poly connections. As mentioned earlier, the lowest connection to the PVC pipe that runs under the walkway leaked a little. Rather than try some complicated PVC repair, I wrapped this connection with part of a bike tire inner tube and clamped it on with two stainless steel pipe clamps from The Home Depot. You can make these out in the photo. It still leaks a little when pressure is on that one circuit, but the clamps keep all the water in the pipes from draining out at this low point when water pressure is removed, which is most of the time. I wish it weren’t like this, but it is. At this point, it is a project for another day. The picture above shows how I tried to simplify some of the black poly pipe connections. The first in the upper left of the photo and the fourth at the bottom of the photo were simple connections, so no change there. The second and third were modified to make them a little easier to work on if something does leak. On the second, I eliminated the complicated elbow-T-elbow stack. It is a little hard to read in the photo, but from the second pressure reducer the horizontal black poly goes to a T and then on to an elbow before exiting the picture to the right. The bottom leg of the T goes through a short stretch of pipe to an elbow and pipe that goes to the bottom PVC pipe that goes under the walkway. The black poly from the third pressure reducer goes horizontally to a T. One side of that T connects to black poly that exits the photo to the right. The other side of that first T connects through a short pipe to a T to the left, and one side of that T connects to black poly pipe that goes to a straight connector connected to the existing black pipe that is behind the copper pipe. The base of this second T connects to one of the PVC pipes under the walkway through a couple of elbows. After all the connections were made and tested, I set the boxes and tucked the edges of the two pieces of landscape fabric up into them the best I could. After this, I put dirt – or sandy dirt – part way around the boxes. The rest of the space I filled with sand. It’s not perfectly clean sand, but clean enough to be able to dig out easily, and without rocks. After filling in with sand, I tamped it down and started working on finishing the project. The river rock area right near the boxes to the top of the next photograph was filled with dirt and in some cases rocks had sunk down and were buried in dirt. I harvested river rocks for a while, filling about four buckets with them. Then I smoothed the ground so the transition from the top box to grade (ground level) was gradual. The boxes sit a little low, and the ground itself needed this smoothing out. After harvesting river rocks and smoothing out the ground, I put down a layer of landscape fabric to keep the rocks from sinking down into the ground. There was old landscape fabric in the area, but it was pretty torn up. You can see some of the old landscape fabric in the upper-right corner of the photo. Also you can see the anti-siphon valve and the water shutoff valve after the anti-siphon valve. After the landscape fabric was in place, it was time to do the fun job of spreading river rocks to make the whole scene look finished. 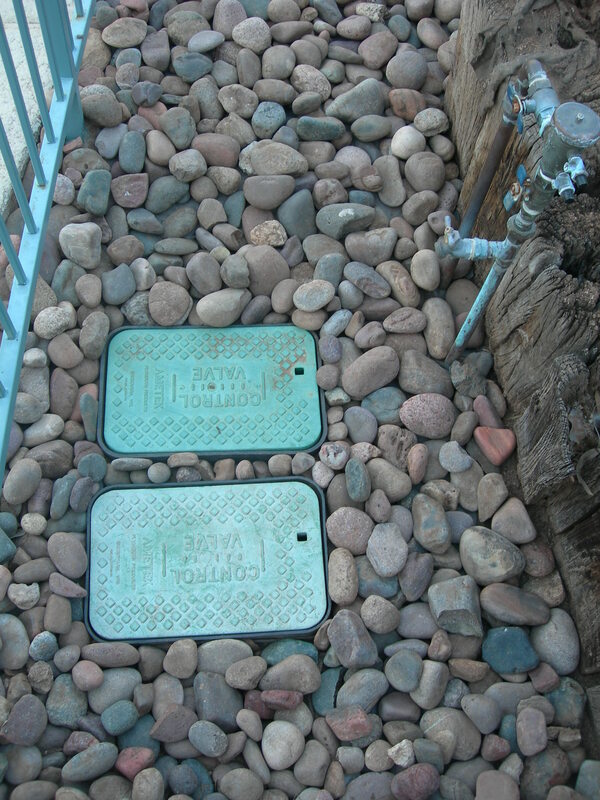 I used smaller rocks between the valve boxes, as space allowed.